L'Eau d'Issey Pour Homme Intense by Issey Miyake is a fresh and woody fragrance for men. The Intense version was launched as a flanker to the popular L’Eau d’Issey from 1984, but as a more intense, passionate and stimulating fragrance. The grey coloured bottle is meant to resemble asphalt and water in true harmony. 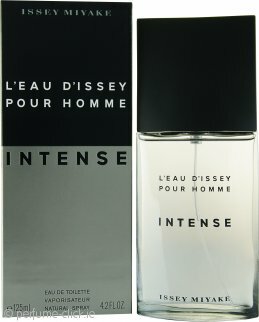 L'Eau d'Issey Pour Homme Intense is not just a more intense version of the original Issey, sure it has the DNA, but the Intense version is its own scent with a bubbling, explosive opening, a spicy geyser and a sensual textured base. You are greeted with an opening of bright citrusy notes, mixed with hints of yuzu and bergamot before the scent thrusts you into the spicy heart of cardamom, saffron, nutmeg, camphor and the elusive blue lotus. It is said that blue lotus is mildly sedative and can help to relax the nerves. The nutmeg follow you right into the base, backed up by cinnamon, ambergris and benzoin. L'Eau d'Issey Pour Homme Intense is a uniquely blended fragrance, try it and see if you stand out from the crowd. L'Eau d'Issey Intense by Issey Miyake was launched 2007. This is definitely my favourite of the Issey Miyake range. Less of a citrus scent than the original, more refined, good longevity too.